We’d love your help. 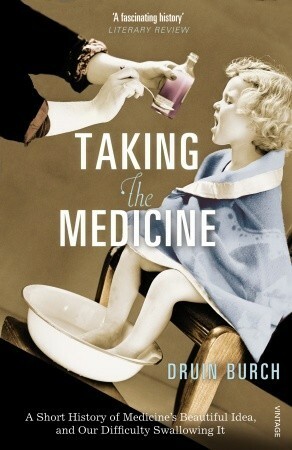 Let us know what’s wrong with this preview of Taking the Medicine by Druin Burch. Doctors and patients alike trust the medical profession and its therapeutic powers; yet this trust has often been misplaced. Whether prescribing opium or thalidomide, aspirin or antidepressants, doctors have persistently failed to test their favourite ideas - often with catastrophic results. From revolutionary America to Nazi Germany and modern big-pharmaceuticals, this is Doctors and patients alike trust the medical profession and its therapeutic powers; yet this trust has often been misplaced. Whether prescribing opium or thalidomide, aspirin or antidepressants, doctors have persistently failed to test their favourite ideas - often with catastrophic results. From revolutionary America to Nazi Germany and modern big-pharmaceuticals, this is the unexpected story of just how bad medicine has been, and of its remarkably recent effort to improve. To ask other readers questions about Taking the Medicine, please sign up. Really clever and most chapters were quite interesting. I learnt a lot. It wasn't riveting but it was, generally, insightful. Props to the author for research well done! If the history of medicine, in the specific sense of "things we take to feel better"--from opium to thalidomide, penicillin to aspirin--sounds at all interesting to you, read this book. That won't apply to most of you, of course. But it was exactly the right opiate for me, and I binge-read the whole book in one day. The author--you get the sense he's a doctor first and a historian second--has a pleasing impatience for quackery both historical and modern. In addition to being a history of specifi If the history of medicine, in the specific sense of "things we take to feel better"--from opium to thalidomide, penicillin to aspirin--sounds at all interesting to you, read this book. That won't apply to most of you, of course. But it was exactly the right opiate for me, and I binge-read the whole book in one day. The author--you get the sense he's a doctor first and a historian second--has a pleasing impatience for quackery both historical and modern. In addition to being a history of specific drugs, Taking the Medicine is also, inextricably, the history of the scientific method. The majority of doctors throughout history have probably had the best of intentions, but that hasn't stopped them from killing a lot more people than they've helped: a situation that changed only quite recently. Possible side effects of this book: a healthy passion for double-blind trials. One of the papyri that Smith bought suggested mixing willow with figs, dates and beer to 'cause the heart to receive bread.' (The Egyptians used 'bread' as a synonym for all sorts of fine things. Their daily greeting for each other was a cheerful wish for 'Bread and beer!' meaning pretty much everything in life that was good.) The historian of aspirin commented that 'many of their superstitions, reasoning and treatments are based on concepts that are alien to us'. That is true, but it is not what really matters. The Egyptians considered their doctors and their medicines as being potent and effective. Their practices show something different. These papyri, the oldest proper medical instructions of our species, contained potions and salves and drugs whose effectiveness was a fantasy. Traditional knowledge of healing was not reliable. The first doctors in the world were frauds. This was a remarkable beginning for any profession, even more so for one that has always delighted in a special trust. For the next three and a half thousand years, little changed. A hospital doctor looks at the use of drugs in medicine. He starts with a historical overview before focusing on persistent problems which still allow insufficiently tested harmful drugs to be released. Reasons are doctors who prescribe because they think it's better than not offering any help, unpublished negative test results and not enough good large studies. If you blindly trust your doctor to take care of your health and wisely prescribe your medication then you might not want to read this book. If, on the other hand, you want to read a well-written history of medicine and the foibles and mis-steps of the medical profession then this is the book for you. An absolutely fascinating page turner. Good overview of the brief history of medicine's evidential basis. Scary when you realize how recently it was that doctors really had no clue what they were doing. Well-written easy to read, well-researched, and right up my alley. Met my expectations.